Peterstone Lakes has provision for up to 120 cars with an overﬂow carpark if required. All car parking is completely free if using our facilities. There’s no need to arrange anything, just turn up, park and play. 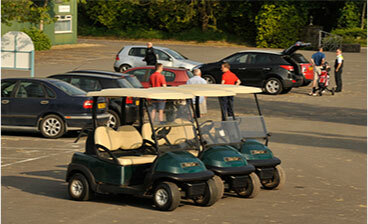 We also hire golf buggies and trolleys at very competitive rates. These can be booked at the Peterstone Lakes Pro Shop, follow the link below for more information.